In this course you'll learn how to mine datasets and predict patterns with Python, build statistical models from raw data and harness to power of data to forecast what's happening next. Grow and develop your skills in web development, user experience design, digital marketing, data science and more with the expert guidance of General Assembly. 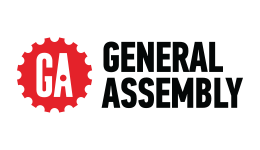 With over 50,000 course graduates under their belt, General Assembly is a trusted quality education provider, offering students an innovative learning experience with courses specifically designed to meet employer needs and market demands. Fill out this form and a Study Consultant from General Assembly	will get back to you.